This script helps you send large amounts of tips in small or medium time frames. It is mainly useful in ohmibod streams. Changes to the default tipping window include adding a "keep this window open after tipping" checkbox and making the whole window draggable. 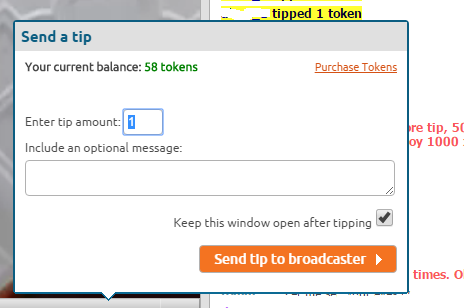 Most of the input fields in the new tipping window should be self explanatory. 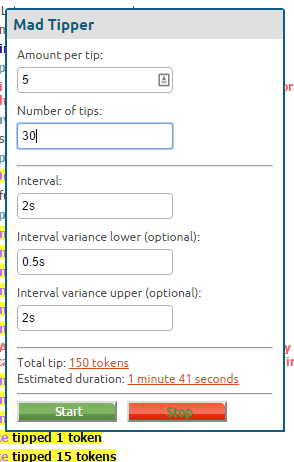 The variance fields make it so that the wait time between each tip is randomly picked such that (tip_interval - variance_lower) <= wait time <= (tip_interval + variance_upper).